After a gap of two years, Rev. Nicola Frail became the new minister of St. John's on 13th January 2004. She had previously studied for the ministry at the San Francisco Theological Seminary in California before returning to Scotland. Nicola is a trained Taekwondo instructor and started a successful group at the Church in April which meets weekly and caters for all levels of ability. During the summer, fund raising enabled a new disabled WC to be provided. A new large screen was acquired which allows all the words to the hymns and songs to be displayed. Church members no longer need to bring their own hymn books to Church. As it is connected to a laptop, it can be used for display of any computer based images and presentations. The annual Guild and Get-Together bus trip visited Loch Lomond for a boat tour and afternoon tea. St. John's participated in a new outreach project, Operation Christmas Child, where shoe boxes were filled with gifts for children, regardless of religion, in countries such as Romania, Poland, Hungary and other areas of poverty. During the first year 118 boxes were filled. This project has continued each year since. Once again, a 'Promise Auction' was held during April with proceeds going to Church funds. Strawberry Teas in the Church gardens were introduced in the summer with wet days catered in the halls - you can never predict the weather! Tea and strawberries were very popular as were the scones, meringues and ice cream! Fair trade stalls and Soup and Sweet Lunches were started and are now regular events throughout the year. 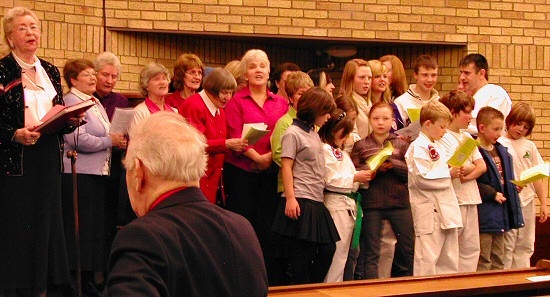 Some of the celebrations during 2005 included the 75th anniversary of the Guild. The Kevock Choir were in concert in the spring which was very successful and well attended. 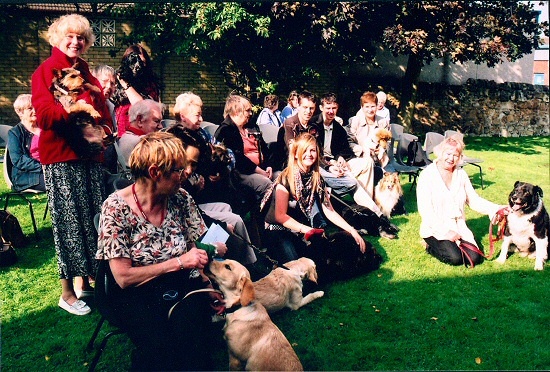 In the summer a special thanksgiving service for animals was held in the Church grounds with many pets joining in, including 14 well behaved dogs! The 'Get-Together' celebrated 25 years with a special cake and many memories. The Sunday School became the JC Club and meet in the Large Hall after the first part of the Sunday service. During the summer months they participate in fun activities such as baking, gardening and drama. In 2007 the Church was 'open' during Lent for a time of reflection on Wednesdays. This allowed a quiet place of prayer with readings and images provided on the large screen. A new 'Christianity Explored' course was started by Nicola which explored the Christian faith. 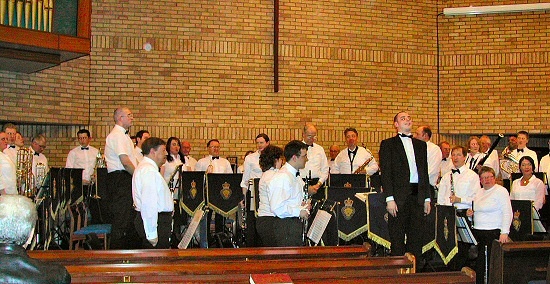 In September a concert was held by the Inverkeithing Big Band which was very popular. At the end of the year, Nicola attended her passing out parade at Sandhurst were she graduated as an Army Chaplin after attending previous training events. Palm Sunday saw the launch of this Church web site - which you are one of many visitors! 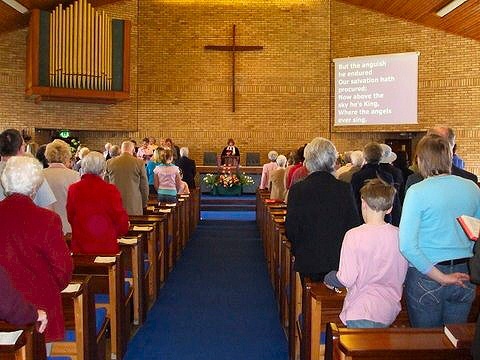 2008 marked the centenary of the Church and many events were held between March and September. Celebrations started with a special concert by the Central Band of the Royal British Legion Scotland at the end of March and continued with a Guild coffee morning in mid-April. The Large Hall was renamed the Methven Hall in honour of John Methven who has been associated with the Boys' Brigade at St. John's for more than eighty years. In April, the Taekwondo Club took a group of members to San Francisco to participate in competitions and be tested on their skills. May saw the annual Guild/Get-Together bus trip, this year to North Berwick, for the Scottish Seabird Centre, and Dunbar. The Kirkcaldy Gilbert and Sullivan Society held a special "Thank You for the Music" summer concert in the Church at the start of June with songs from forthcoming productions and other favourites. With the Forth Road Bridge walkways closed for engineering works, the annual Christian Aid sponsored walk was replaced by the Church's own event on the 21st June in the Beveridge Park. Sadly the St. John's Playgroup decided to close after running since 1972. Recent government policy now offers free nursery care for young children at local schools. The playgroup may re-open if circumstances change in the future. The start of July saw a special visit by the African Children's Choir as part of the their UK tour. A packed Church was thrilled with the energy and ability of all the children. 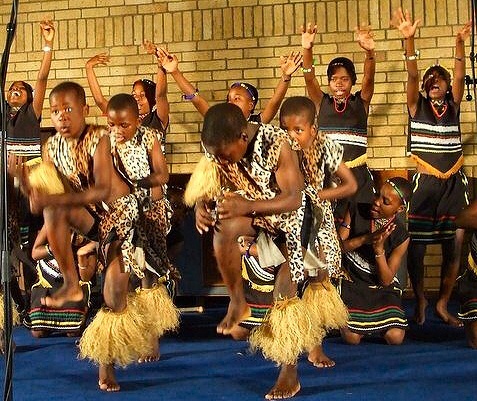 The Children all came from South Africa and performed a selection of traditional African songs along with wild energetic dancing to the beat of the drummer boys. During their three day visit, local host families looked after the children and adults whilst local schools organised special fund raising to support their work in Africa. The choir then moved on for a residency at the Edinburgh Festival. 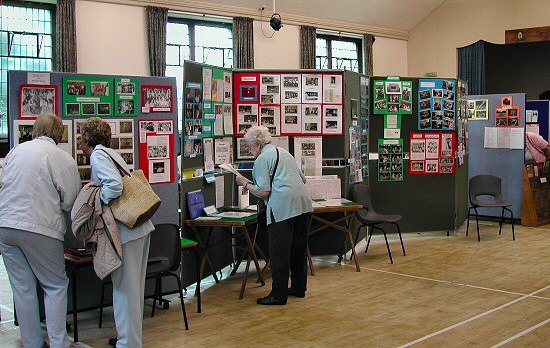 A Memorabilia Exhibition was held in the Methven Hall over the first four days of August. 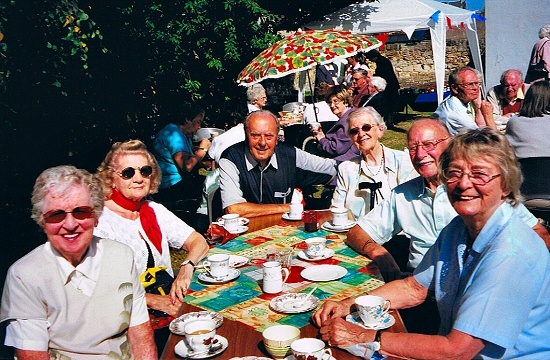 As well as telling the story of the Church with pictures from the late 1800s to the present day, there were written memories from members of congregation and many pictures from the Church organisations over the years, including Sunday School picnics and Boys' Brigade and Girl Guide camps. As part of the centenary activities, The Women's Group have documented their history so far in this new document: Women's Group 1970-2008. To celebrate 125 years of the Boys' Brigade a special service was held on the 31st August with the Moderator of the General Assembly of the Church of Scotland, The Rt. Revd. David W. Lunan participating along with the Moderator of Kirkcaldy Presbytery, Mr Ian Biernat and members of St. John's 4th Kirkcaldy Company of Boys' Brigade. 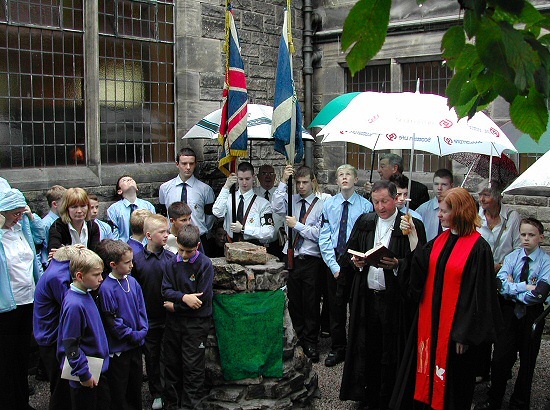 As part of the service a Cairn was dedicated to the Boys' Brigade and to John Methven who celebrated 72 years of association with the Brigade. The annual service for Pets was held on a sunny day in September, all the more welcome after the dull summer days. 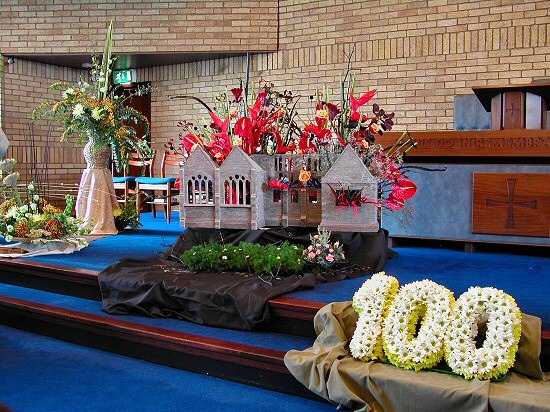 In September, an anniversary flower festival was presented in conjunction with Kirkcaldy Floral Art Club. The theme was "Community Connections - Then and Now". Fifteen themed flower-works were created with additional displays around the Church. A selection of wedding dresses covering the last 100 years were also displayed in the hall where refreshments were provided. At the end of the month a special centenary service was held along with a lunch at the Victoria Hotel. St. John's welcomed the former Moderator, The Very Revd. Sheilagh Kesting, who delivered the sermon, and our former minister Rev. Sam McNaught who read the prayers of intercession. Musical highlights included the Kirkcaldy North Primary School Choir. 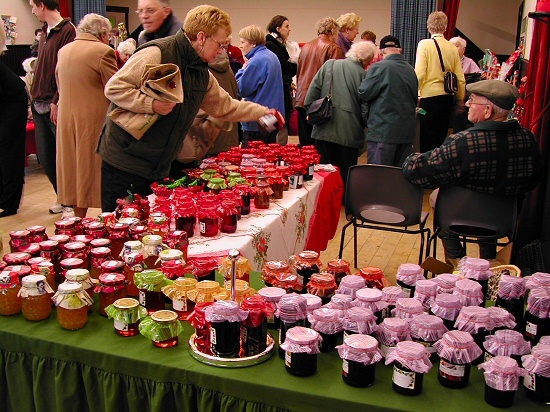 The annual Christmas Fayre was titled "Sale of the Century" to reflect the Church anniversary and offered the usual mix of homemade baking, clothing, jewelry, books, tombola and raffles. At the end of November a very special Centenary Concert was held in the Church featuring contributions from the organisations. Led by Ann Mitchell with choirmaster Brian Booth, the programme featured songs, monologues, a fashion show and an attack by masked Taekwondo experts. View the full programme. The concert certainly ended the centenary year with a bang! The Advent season saw a number of new features introduced. Poinsettias were available for purchase with each plant dedicated to an individual. 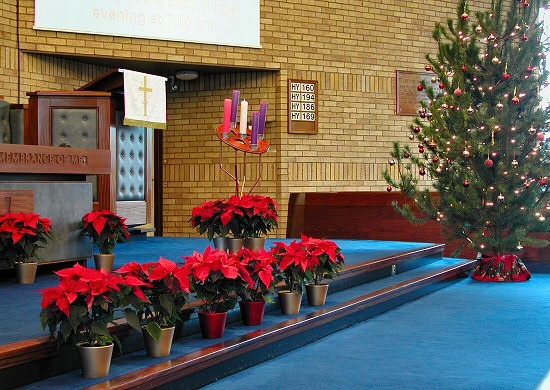 The plants decorated the Church until Christmas Eve when they were distributed to their new owners. Also new for 2008 was a short Christmas morning service which was held at 10am. Attendees were invited to bring along one of their presents - which they could take home again! Looking back over the centenary year, St. John's enjoyed concerts, demonstrations, an exhibition, a flower festival, a celebration of 125 years of the Boys' Brigade, a visit by the Moderator of the General Assembly along with quite a number of other activities. A very successful year with a magical ending as St. John's senior elder and captain of the Boys' Brigade was awarded special recognition.... but we've kept this story to lighten up 2009!